Whole wheat and added bran make this cake dense and whole orange makes this really fragrant and moist. Whole grain cakes baked without white flour are great with fruits and no one would tell you it tastes healthy. It is yummy, just that. I love baking tray cakes with fruity flavors, orange being an all time favorite of course. 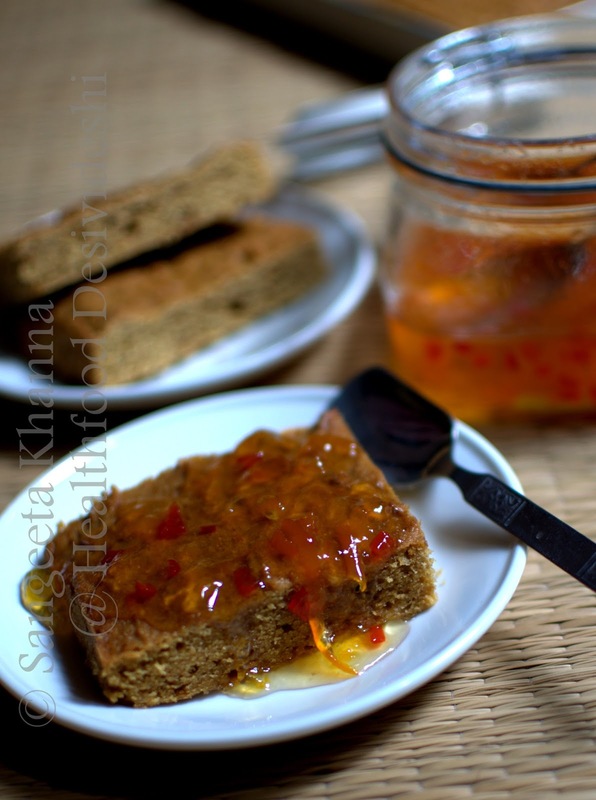 Sometimes I add carrots to add more moisture to the cake and supplement the orange flavor with marmalade glaze. This cake was different from that. 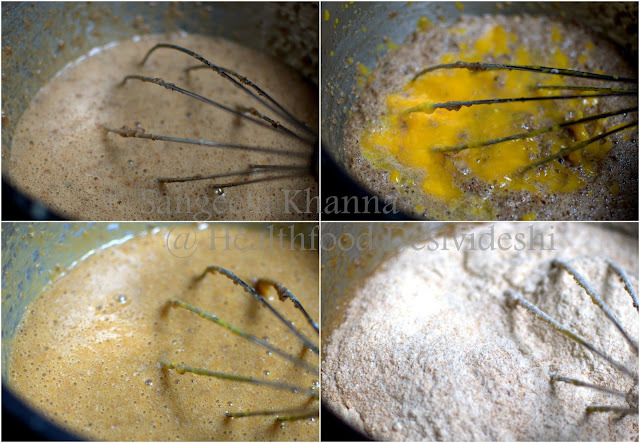 The orange is pressure cooked first, pureed and then used in the batter, so the softness of the cake is even better. Cooking the orange takes a little extra time, but you can always cook it a day in advance and refrigerate, so it is cold to be pureed and blended into the batter when required. The good thing is, this cake does not require any flavoring agents, essence or extracts. The whole orange going into the cake ensures potent flavors. Pressure cook the oranges with 1/2 cup of water till the first whistle. You would like to remove the stalk of the oranges if it is still attached. Cool down, cut into halves and press to let the seeds slip out. Collect all the liquid that drains and puree it along with any remaining liquid. The puree will be about 1.5 cups. Cream the butter, sugar and eggs together. Add the pureed oranges to it. Whip again to mix well. Mix the flour, baking powder and baking soda together and put into the whipped eggs and oranges mixture. Whip again to mix well. Do not overdo the whipping at this stage. The batter will be quite thick that hardly flows. You might want to add 2-3 tbsp of whipped yogurt if it is too thick to spread. 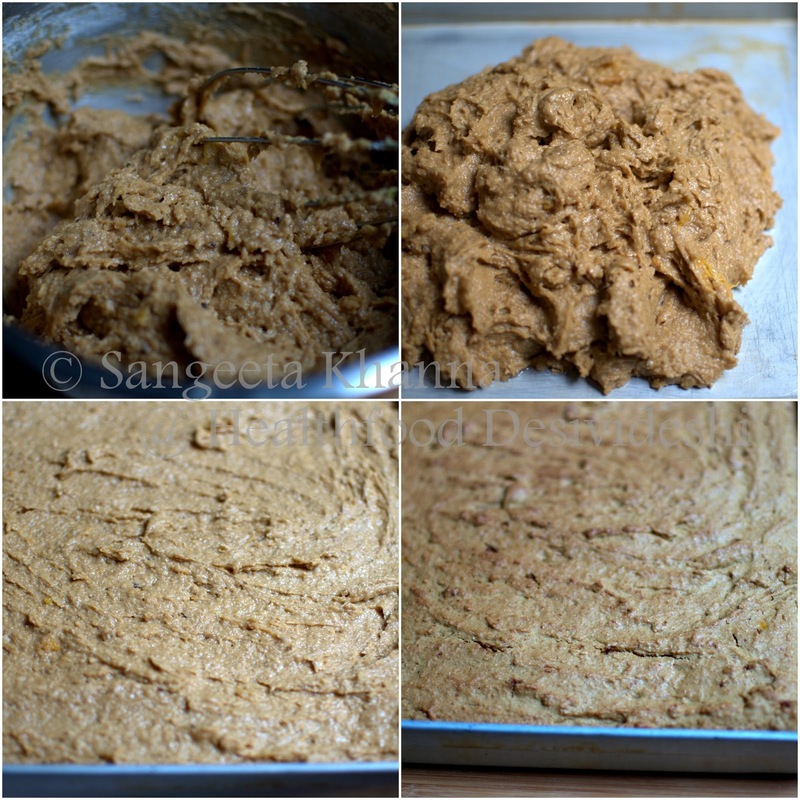 Pour the batter into a greased tray or a loaf tin if you want bread like slices. Preheat oven for 5 minutes, slide the tray on medium rack and bake at 180 C for 50 minutes. You would want to check if it is a loaf by pricking a skewer. In case of a tray bake, a lightly browned crust indicates the cake is done. Take out of the oven, invert the tray onto a cooling rack and let the cake cool down completely before slicing. It has a bread like texture but very rich aromatic taste. It was loved with the Kumquat-chilly marmalade and with whipped cream as well. Arvind even liked it with nutella and also with peanut butter. One more very unusual topping he loves with oranges cakes, it is the Amul saffron flavored shrikhand. It tastes really good as a cake topping believe me. This cake is better consumed warm as whole wheat and bran make it feel dry when you have it cold or at room temperature. Reheating it in microwave just for 5 seconds is enough if you are having one slice. This cake makes a nice breakfast option along with milk and you might want to add some nuts if you don't have nuts otherwise for snacking. We consume a lot of nuts as snacks so I mostly don't add more to the cakes. Sweetening is mild as I have used very little sugar in it. This raw sugar I use is not too sweet so you might like to add some more sugar if you like the cakes fully sweet. 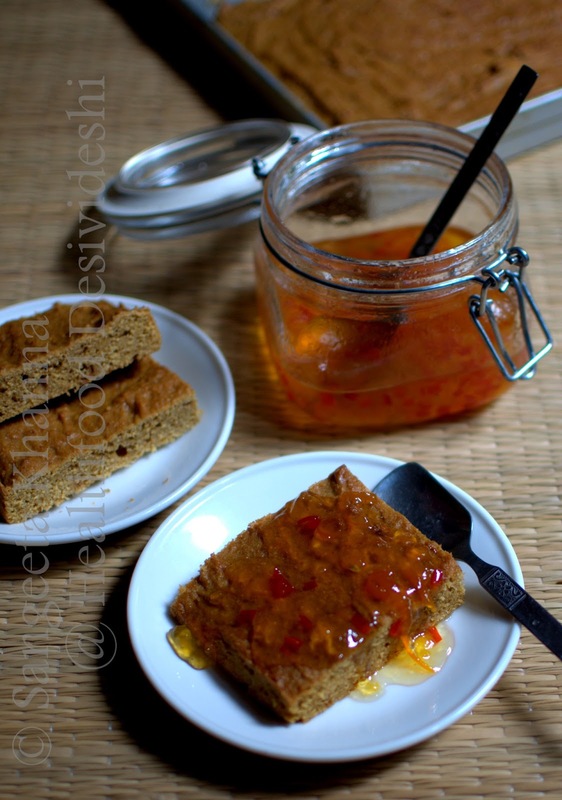 Or you can always have it with jams and marmalade or even nutella. 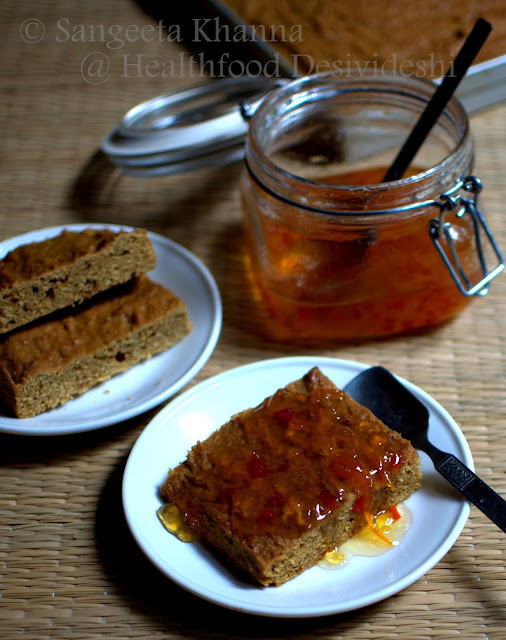 Enjoy this deeply orange cake and let me know if whole wheat cakes are enjoyed in your family. I absolutely love the fragrance of citrus fruits-Orange is divine. A nice healthy version of a whole orange cake...I have made whole wheat cakes but not with added bran. I guess bran in this cake wouldn't be noticeable because of the moistness which whole orange gives. And I liked the idea of srikhand topping for cakes. That is really wholesome recipe.How can we make eggless version of this cake? 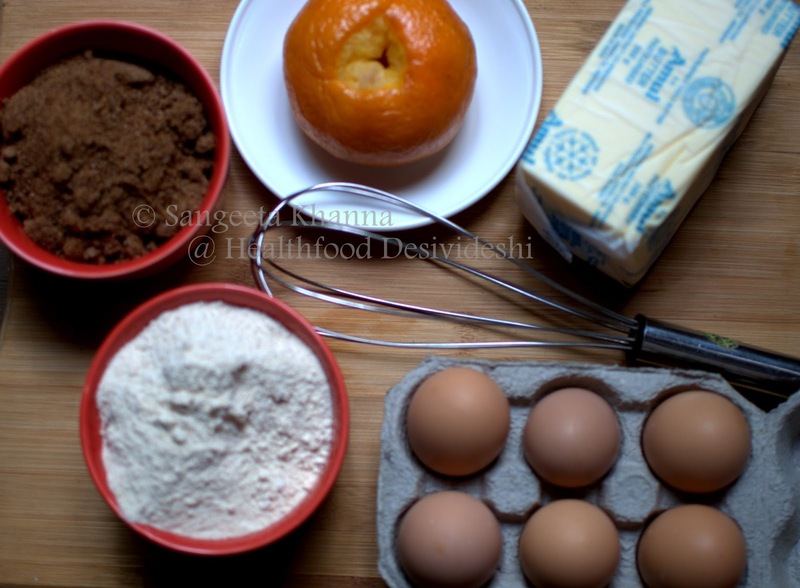 The orange cake egg less has been posted earlier Shweta. 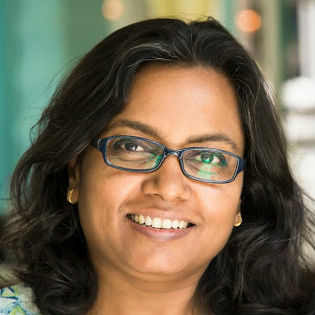 Check out the link shared in the second para of this post. So healthy and so delicious. YUM!! I like Arvinds accompaniments to the cake... even more yum! 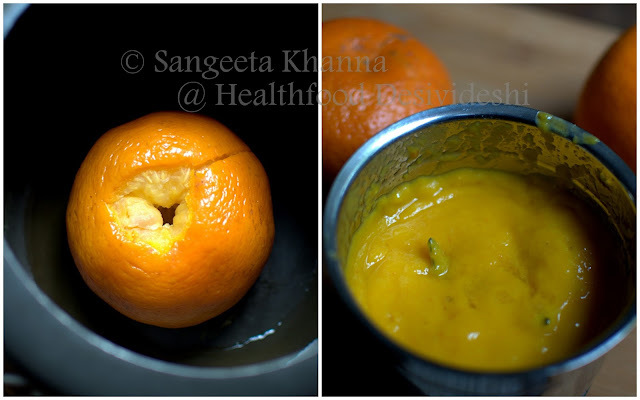 ha ha..you just discard the seeds and blend the orange with peel Amrita. Will bake this cake for you soon and I am sure you would love it. it is a yummm cake,,,,made this for my family and they loved it! Can we use sunflower oil instead of butter... If it works then how much oil I can use?